When any person detained or restrain in a specific place against his/her wish or unlawfully more than twenty four hours and also apprehension that Person’s life in danger. Then, we can say that person in illegal custody of the detainer or restrainer (Who stop him/her from moving that place). Then it’s not matter that who is the detainer or restrainer. For example it’s may be Parents of the child, Husband of the wife and even police who arrest a accused and detain in custody the accused but didn’t produce the accused before the area magistrate within 24 hours, it also called illegal custody. 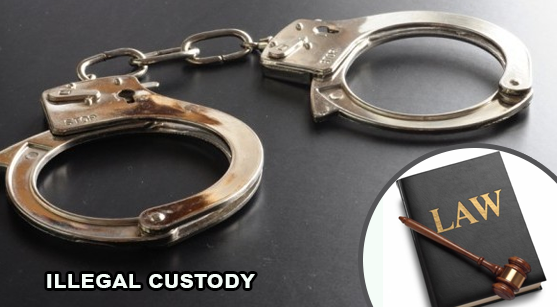 The most effective remedy of the illegal custody or detention is WRIT OF HABEAS CORPUS. This writ can be file only in the Hon’ble High Court. Illegal custody has very much difference with kidnapping, in kidnapping, person (accused) kidnap by somebody from one place and take it to some another place with the some bad intention like demand of money, with intention to kill him/her and some other purpose which only knows by kidnapper and even relative of the person ( who was kidnapped) by the kidnapper don’t know the kidnapper and place where the victim has been stayed now. On the other hand, in illegal custody, person who is in custody knows the detainer, place where he/she restrain and motive of the detainer. Although, person belong to him/her also know the every fact of the situation. For example it’s may be Parents of the child, Husband of the wife. In most of cases of illegal custody close relative is involve and in kind of cases police doesn’t took step. in our legal system, it is very clear that, when police registered a FIR against a person and arrest him/her, after arrest he/she will be produce before the area magistrate with in twenty four hours and if police not produce the person before the magistrate it seems person in illegal custody. In that situation, interested or well wisher of the person (who is in custody) does only one thing, approach the high court for releasing the person. Because only high court have power to provide the legal remedy in shape of Writ of Habeas Corpus. It is big question, when a person himself in illegal custody of someone and nobody allow meeting him, how he/she can file a petition being remaining in illegal custody before the court? In this situation, petition file by the any other person having interest in such detenue. For example a wife, a father or even a friend may in such situation make the petition for writ of habeas corpus. The petitioner should not, however, be a total stranger. The writ of habeas corpus provides effective remedy against illegal custody or restraints. This is a writ in nature of an order calling upon the person who has detained by another person or any agency (Private or Govt.) to produce before the court immediate effect. If the court comes to the conclusion that there is no legal justification for the imprisonment of the person concerned, the court will pass an order to set him at liberty forthwith. The object of the writ of habeas corpus is to release a person from illegal detention and not to punish the detaining authority. A writ of habeas corpus may be issued against any person or authority that has illegally detained or arrested the prisoner.